Not one hour after receiving that ad on the Netflix envelope, we received an email from, we assume, a PR type that announced VH1 had placed "rocks" all over Manhattan supporting the program. Ah, now things became a bit clearer. The announcement tells us, "Rock Honors celebrates four of metal's most imaginative groups; Def Leppard, Judas Priest, KISS, and Queen explaining how each band came up with its sound and measuring the influence each has had on modern music. Godsmack, Foo Fighters, and the All-American Rejects help praise the heroes of metal." Now that that's settled, we;re told a second wave of "rocks" will appear next week to further promote the program. 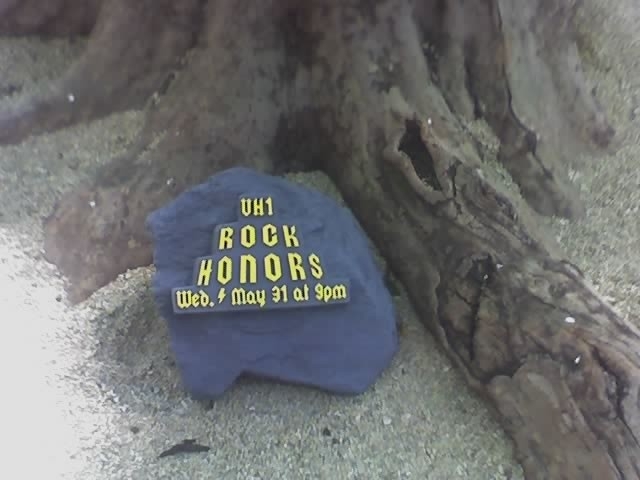 At least the rocks displayed the VH1 logo in a manner that could be easily seen. So that's what the ad was for? I threw it out without ever knowing what it was for exactly. The ad is a co-op with Lenscrafters. Fans and celebrities find out if their stories have true rock n� roll grit when they share their outrageous rock n� roll stories. LOS ANGELES, May 25, 2006 - Leading up to the 1st Annual �VH1 Rock Honors� fans will confess their wildest rock n� roll stories for a chance to win great prizes. For two nights, confessionals will appear in and around popular Los Angeles venues where rock fans will get their chance to share their outrageous stories or confess their secrets. �We hope that these events will build awareness of the VH1 Rock Honors tribute and reignite the passion we all feel for rock n� roll� said Jeff Frumin, CEO of Universal Consulting Group, an experiential marketing firm helping VH1 make this campaign come to fruition. �VH1 Rock Honors� will pay tribute to KISS, Queen, Def Leppard and Judas Priest on May 25th at the Mandalay Bay Events Center in Las Vegas and will premiere May 31st at 9PM. The show will include three live performances by each of the honorees as well as three live tribute performances each by Godsmack, Foo Fighters, The All-American Rejects and Paul Rodgers. The confessions will provide true rock n� roll fans an opportunity to be recognized along with their idols. The influence of the VH1 honorees will be told through the stories their fans share. When select confessions appear on Rock.VH1.com, rock fans will see how their stories stacked up against the competition. Confession booths, aesthetically similar to the common Catholic confessional, will be present at each event and during the official after party at the House of Blues at the Mandalay Bay Hotel in Las Vegas. Not to worry, each booth is fully sound proof, guarded by men in black and fans can opt out of having their confession posted on Rock.VH1.com. Tickets priced at $60, $125 and $175, not including applicable service charges, are currently on sale via www.ticketmaster.com and at all Ticketmaster outlets, in Las Vegas by going directly to the Mandalay Bay Box Office or by calling 877-632-7400 or 702-632-7580. For VIP Tickets Contact VH1 Save The Music at 212-846-7882 or rsvp@vh1.com. Confirmed confessional dates and locations are listed on page two. Additional venues will be announced. Universal Consulting Group, Inc (UCG) is a full service experiential marketing and promotions agency that creates and executes integrated programs connecting brands to their target consumers.